Remarks:Alvocidib is a synthetic N-methylpiperidinyl chlorophenyl flavone compound. As an inhibitor of cyclin-dependent kinase, alvocidib induces cell cycle arrest by preventing phosphorylation of cyclin-dependent kinases (CDKs) and by down-regulating cyclin D1 and D3 expression, resulting in G1 cell cycle arrest and apoptosis. 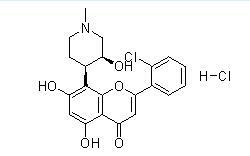 This agent is also a competitive inhibitor of adenosine triphosphate activity. Check for active clinical trials or closed clinical trials using this agent.